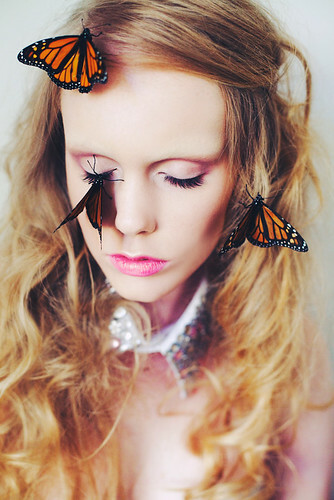 A few months ago Caitlin Worthington, Rebecca Joanne, Melissa Cook and myself joined forces to collaborate on a beauty editorial featuring live Monarch butterflies. 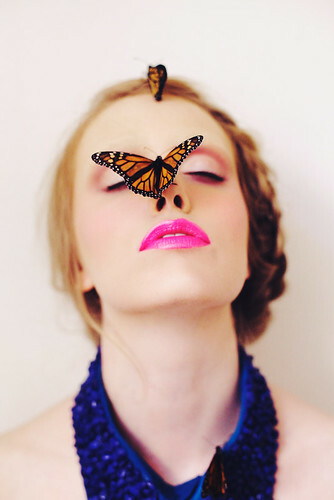 Big thanks to Elleshia Edwards at Chadwick’s for modelling for us and for tolerating butterflies flapping on and around her face while we were shooting! I made all of the collars Elleshia is wearing using second hand shirts, my trusty hot glue gun, some rocks from an aquarium store and lots of crafty bits and bobs from op shops and Spotlight. Misery Is A Butterfly – BTS Video. from Caitlin Worthington on Vimeo. Great idea for collars and photos.